Casa Pina is a very low cost private villa in Umbria. Only 1000 Euros for a week in this splendid villa with pool for 7 people during the high season. The low season is even more convenient, at only 650 Euros for the week. The property is wrapped up within blossoming greenery, like it is customary to a property or home in Umbria. The spot is really exclusive nonetheless handily placed in the proximity of urban areas and services. The place grants you weeks in absolute peacefulness, and provides the possibility to check out near by outstanding attractions and famous urban areas. Umbria is rich with sites to see and popular places. Here nature and traditions go along in hand. Acquasparta is the most adjacent village at below 5 kilometers away. There you are able to locate almost all products and services like supermarkets, outlets, eating places, pharmacies along with other services. Casa Pina is included in the totally secured estate, a private villa in Umbria immersed within the green nature of the region. 3 hectares of garden land hold the 135 square meters of Casa Pina, all developed on one level and including modern day comforts. The house is composed of two matrimonial rooms, of which one having a television set, one double bedroom with two twin beds, one single room having a single bed. A child cot without charge can be had on demand. There are two restrooms, one with shower and also en-suite to one of the two double bed rooms, and the other bath has a tub. The day area is spacious and comfy. The fireplace, satellite television with foreign stations, media disk player will give moments of peacefulness and amusement in any season. The considerably sized cooking area is fully outfitted for your personal self-catering holiday in Umbria with a family fridge with freezer, electric oven, washing machine, dishwasher, and ironing table with iron. The lawn is also completely fitted thanks to a fantastic wood brick oven for pizza parties and bakery making, a barbeque, table tennis, clothesline, and lots of sitting and table room for al fresco dinners. The deck and the pool are equipped with sun beds to fully relax. The swimming pool also offers a lot of privateness within a panoramic spot, and a discreet hot water shower. 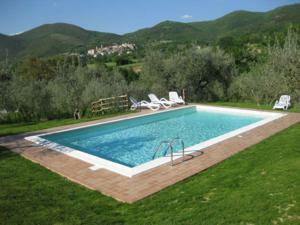 Take advantage of this modern private villa with pool in Umbria, prices this good come in handy rarely!